Some long-term silver analysts are predicting a huge run on silver over the next few years. They also believe that the gap between the price of gold and the price of silver will be narrowed significantly. 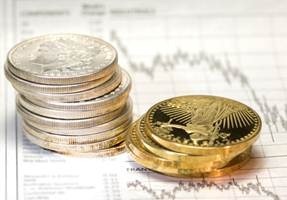 These silver bulls base their projections on historical data as well as current trends. This is good news to those of us that are fond of buying silver. After all, considering the price of gold, silver is one of the few remaining commodities that the average investor can physically hold in any large quantity. So why are these silver bulls so optimistic? Most likely it’s related to the driving force of all commodities: supply and demand. For the first time in the history of modern mining, many of the world’s leading mines are coming up empty. It is estimated that 95% of all silver ever produced has already been consumed and unfortunately most of it ends up in our landfills. If the current supply of silver were evenly distributed among everyone on earth, there would only be enough for each of us to have 1/3 of one ounce. For many years now, the world has been using more silver than it has been producing, yet many people continue to assume that silver is abundant. That hasn’t been the case since the industrial revolution. Major government stockpiles from the past have slowly been sold off for industrial use. For years now the annual global mining production has not been able to keep pace with consumption, both investment and industrial. As opposed to gold’s limited industrial applications, there are literally ten thousand industrial applications for silver. It is essential to the production of medical, telecommunications, computer and automotive equipment, to name just a few. Silver has many useful qualities; the most valuable to the manufacturing sector is its unsurpassed qualities as a conductor of electricity. As electrical power continues its growing dominance around the globe, the industrial demand for silver is expected to continue to grow dramatically as well. Also, considering China’s mammoth appetite for precious metals that are essential to its continued dominance of product manufacturing, many insiders are projecting an even steeper rise in demand in the short term. Just like industrial demand, investment demand for silver is also at record levels and growing steadily. As more and more investors continue to embrace precious metals, many of them are seeing the incredible potential of silver. According to Bloomberg News, investors currently hold over 18,000 tons of silver-backed exchange-traded products, which is the equivalent of over eight months of global mining output. Morgan Stanley and Barclays PLC are predicting that investors will likely buy another 500 tons in 2013. Another sign of growing investment demand is the incredible popularity of the U.S. Mint’s silver Eagle coin. The mint is barely able to keep up with demand and there have been several occasions recently when the mint had to ration sales. Even though gold continues to perform well and will likely remain the dominant precious metal for investment purposes, silver is likely to close the gap considerably in the very near future. When you consider the dwindling supply and growing demands from investors and manufacturers, you can begin to understand why the silver bulls are so optimistic. Jacob Harrison is a precious metals investment specialist from Australian Bullion Company, Australia’s oldest privately-run precious metals wholesaler and retailer.